Our facilities may be rented for rites of passage and events for non-members. A Unitarian Universalist wedding ceremony is a unique celebration of the joining of two people on their life’s journey. There is no set liturgy or format but rather each ceremony is a creation by a team made up of the couple and the minister. The goal is to create a ceremony that is unforgettably beautiful—one that features the timeless rituals of weddings even as it contains elements which are personal and unique. Unitarian Universalism places great emphasis on individual freedom of belief. A Unitarian Universalist marriage ceremony is based on the personal integrity of the participants rather than on institutional forms. Inclusiveness is highly valued and Unitarian Universalist ceremonies strive to honor different religious backgrounds and cultural traditions. In Unitarian Universalist tradition, we do not usually baptize infants. This is for two reasons. First, we do not believe in original sin (believing rather in the original blessing of each life), and second, a baby is not yet old enough to choose his or her spiritual path. Instead, we offer a naming and dedication ceremony which celebrates each child in his or her uniqueness and asks for the commitment of the parents and congregation to the child’s well-being and development through the years. In the dedication ceremony, which is held during a Sunday morning service, each child is blessed with a rose, symbolizing both their loveliness and the unfolding possibility of his or her life, and with water, symbolizing the source of life in which he or she came into this world. It is a joyful rite of passage both for the family and the congregation as a whole. Child dedications are included in worship services throughout the year. To participate in a child dedication ceremony, contact Rev. Angela Herrera or Ministerial Resident Dan Lillie. Do we need to be members of the congregation? 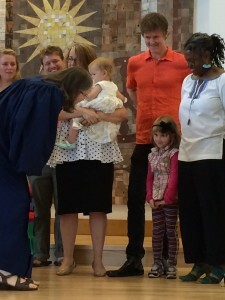 While there is not a formal requirement for membership, the dedication ceremony is for parents who intend to raise their children in the Unitarian Universalist faith, and is most meaningful when the families participating feel a connection with the congregation and with Unitarian Universalist faith and values. Can we include a recognition of god-parents for our child/children? If there are special people that you have asked to take on this committed relationship with your child/children, then the dedication ceremony is a place to honor that commitment. Our child/children have not been baptized or dedicated and are no longer infants. Can we still have them dedicated? We dedicate children and youth of all ages, with appropriate changes to the ceremony reflecting the age of the children being dedicated. Is there a fee for having our child dedicated? There is no fee for child dedications in our Sunday services. We are glad to have a chance to celebrate our youngest members and the future they will help to build. Can we have a private dedication, or does it need to be held with the congregation? Occasionally, there are circumstances in which a private dedication makes sense, but for the most part, families are encouraged to see the dedication as an event for the whole community. If a family wishes to dedicate their child or children privately in a ceremony that does not involve a congregational commitment to the family and vice versa, circumstances and fees should be discussed with the ministers. A Unitarian Universalist memorial service celebrates the life of the deceased. The service is personalized; it is developed by the family and the presiding minister in order to draw hearts together in the healing people can offer each other in times of great loss. Services usually include a eulogy, which can be done by the minister or one or several friends and family members, comforting readings, meditations, and prayers, as well as music and comments and tributes from the congregation. However, all services are individually designed. Each spring we offer Coming of Age classes to our eighth graders as they prepare for high school and a bigger role in our faith community. Students learn more about Unitarian Universalism and themselves as they prepare “This I Believe” statements and together lead a service for the entire congregation. Other rites of passage, such as vows renewals, house blessings, adoption ceremonies, and other individually designed rites of passage are also possible. Contact the ministers for more information.